When you go on vacation, the money you spend on eating out can easily blow your entire food budget! 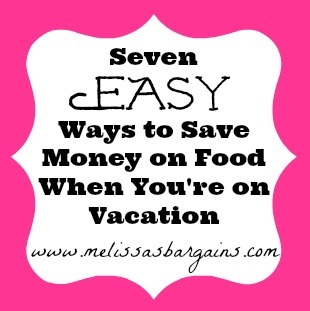 Here’s a round up of easy ways to save money on food when you’re on vacation! 1. Bring your own food – When we went to Disney World last summer, we had a meal plan that included one quick service and one table service meal. We had a refrigerator in our room and we drove, so we opted to take our own breakfast foods (cereal, Nutrigrain bars, Pop Tarts, etc.) and we ate breakfast in our room every morning. We also take our own snacks and drinks. Have you seen the price for a soda in a hotel vending machine? They are usually $2-3 each and you can get a 12 pack for that price before you leave! Don’t forget to pack a cooler for your road trip! Stop at a park or rest stop along the way and have a picnic! 2. Look for hotels that have free dining options or a kitchen! Whenever possible, we try to choose a place to stay that at least offers a free breakfast. Some hotels also offer snacks in the afternoons and even appetizers and drinks in the evening! Some extended stay hotels have kitchens. Buy your own food and cook while you’re there! 4. Use gift cards – Even when we are not on vacation, we rarely eat out if we don’t have a coupon or a gift card. I earn gift cards from various survey sites and cash out when I know we’re going on a trip! I also earn restaurant gift cards through my credit card rewards program. 5. Check out Restaurant.com – Restaurant.com frequently has promotions where you can get a $25 gift card for just $5! They have restaurant locations in many cities. You can view menus and even read reviews! Make sure you read the fine print on their gift card offers before purchasing because they sometimes have exclusions (such as lunch or dinner only) or minimum purchase requirememnts. 6. Timing is everything! The time of day that you choose to dine can help to greatly reduce expenses. For example, most restaurants offer a “lunch menu” and you can typically order from that menu until 4 p.m. If you go to eat just a little bit earlier, you can beat the crowds and still take advantage of less expensive dining options. On that same note, some restaurants offer “happy hour” specials (these are typically served between 4 p.m. and 6 p.m.). Happy hour specials often include half price menu items. Many restaurants also offer “kids eat free” nights. Typically, “kids eat free” nights are on Mondays, Tuesdays, and Wednesdays, and choosing to take advantage of this offer can save you $4 to $6 per child. 7. Skip the extras and watch what you eat! Consider ordering a larger meal portion and then splitting it with someone else. You can ask for an extra plate and you can typically add extra side items such as vegetables or a salad a la carte. If you order water instead of beverages you can also typically save an additional $2 per person. Skip dessert at the restaurant and grab ice cream on the way home instead. If you do opt to have dessert there, share it with someone else. How do you save on money on food when you’re on vacation? This post is reader inspired! If you’re planning a road trip and don’t want to use your own vehicle, find out how to save on rental cars! When we’re planning a road trip, we often use rental cars to save wear and tear on our own vehicles! If you are flying, but need a vehicle once you reach your destination, rental cars are great, too! Are there coupon codes for rental cars? If you have a Costco or Sam’s Club membership, check out their travel services area and price rental cars! 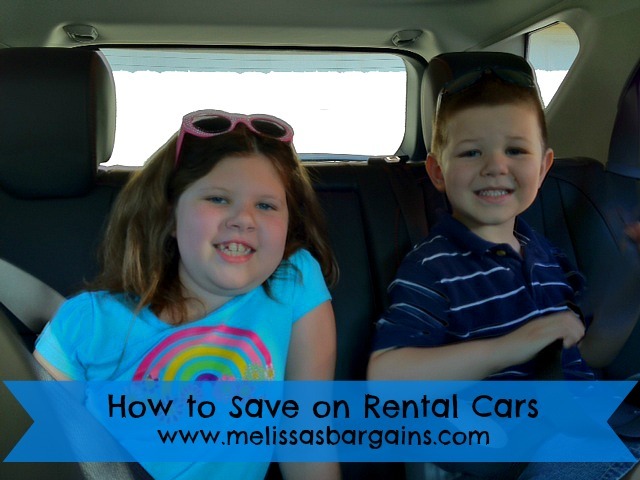 The past few times we have rented a car, we have gotten our biggest savings using our Costco membership! Use a site that specializes in discounted travel deals such as Hotwire.com or Priceline.com See what rates they have available or you can name your own price, too! I have rented several cars using these services and have gotten them from well-known companies such as Hertz and Avis! Decide what size is right for you – Descriptions of rental car sizes can vary from company to company. Make sure the car that you’re renting is big enough to accommodate your needs. Make sure your car insurance will cover you – Find out if your car insurance will provide coverage for you while you are driving a rental car. If not, the rental companies usually offer discounted policies. Fill the car with gas before you return it – Car rental companies charge premium rates (close to $7 per gallon!) if they have to put gas in the car. I forgot once and I will never make that mistake again! Thrifty Thursday: Start saving in 2012 with a change jar! Two years ago, we decided to do something different and we started a change jar. Whenever we got change from our purchases, we would add it to the jar. We were surprised when it was completely full by May that year and even more surprised when we went to cash it in and we had almost $100! We both had guessed that it would be somewhere between $30 and $60! Those pennies, nickels, dimes and sometimes quarters really do add up! We have used the money from the change jar to have extra spending money for family vacations and we have also used to it to pay for Christmas gifts. If you cash out your change at a Coinstar location, there are no fees if you get a gift card. They have gift cards for Amazon, Gap, Chili’s, Old Navy, JC Penney, and even Kroger!! Even our kids have gotten into this and they were so excited about throwing any change that they found into the change jar that we got each of them a piggy bank this week (they have them at Dollar Tree stores if you’re interested!) and now they’ve started their own change jars! If you’re looking for a fun and easy way to save this year without taking money from your paychecks, a change jar is a great option! It works for us. I hope it will work for you, too! *This post may contain affiliate links. Please refer to my disclosure policy for moreinformation. Thrifty Thursday: Five tips for saving on back to school clothes! 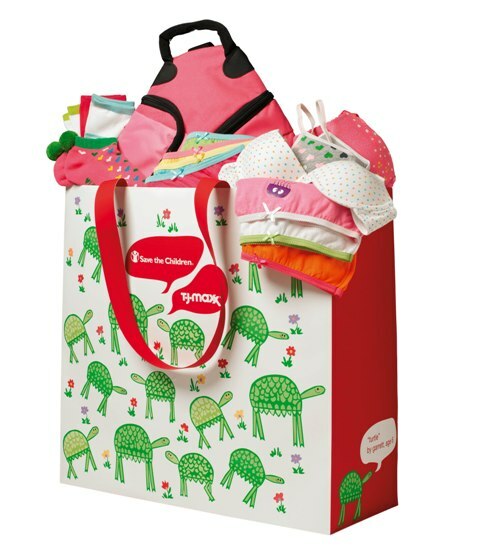 The expense of back to school shopping can add up quickly! Here are five tips to help you save money on clothes as you start your back to school shopping! 1. Set a budget ~ It’s not always fun to create a budget, but it helps to alleviate a lot of stress down the road! Consider your monthly income and expenses, decide how much you have to spend, and stick to it! It helps if you use cash only. Also, if you have any gift cards you can use, add those in! 2. Sign up for e-mail offers from your favorite stores ~ Most stores have some sort of e-newsletter and many of them send great valuable offers by e-mail. Here are a few to sign up for: be sure to check the websites for other retail stores that you love! 3. Combine coupons with sale prices ~ Watch for sales on the items you need and combine the sale prices with coupons. Many stores also offer a 7 day price guarantee, which means that if the price drops within a week of your purchase, they will give you the price adjustment in cash. Also, if you are shopping online, don’t forget to shop through a cash back site to save even more! Sometimes theses sites have special coupon codes available when you shop with specific reatilers. Ebates is my personal favorite! If you haven’t signed up yet, you can sign up here and you will get a $5 bonus after your first purchase. 4. Don’t be afraid to check out consignment sales or consignment stores ~ You can score name brand clothing in great condition at a fraction of the price! Find out how you can also make money by selling items at consignment stores in this post here. 5. Shop during tax free days if your state participates ~ You can find a full list of tax free shopping dates by state as well as what’s included here. Barnes & Noble’s Summer Reading Imagination’s Destination ~ Kids in grades 1-6 can read any 8 books, record them in their journal (along with why they would recommend the book), and then bring their completed form to a participating Barnes & Noble location between 5/24 and 9/6 for a free book! Details are here. Many Barnes & Noble stores also offer a weekly story time and craft for kids. Check here for an event in here your area. Book It Summer Reading Challenge Sweepstakes ~ Read five books between 6/15/11 and 8/15/11, submit the completed form and enter to win a prize pack that contains the following: tote bag, water bottle, mini flier, mini ball, sunglasses, jump rope, book light, Mr. Popper’s Penguins, and a $20 Visa gift card. Details are here. Borders Double Dog Dare Challenge ~ Read 10 books between 6/1/11 and 9/5/11, complete the form, and bring the form into a local Borders or Waldenbooks store to get a FREE book. Details are here. Chuck E Cheese ~ Print the Reading Rewards calendar, read every day for 2 weeks, and get 10 free tokens! Food purchase is required (I think in the past, a drink has counted as the “food purchase”) Details are here. Half Price Books Feed Your Brain Summer Reading Program ~ Print out the reading log, have your kids read for at least 15 minutes each day between 6/1/11 and 7/31/11 and track it on the log, and once they’ve read for 600 minutes, and turn in your reading log between 7/25 and 8/7 to get a $5 Back to School Bucks summer reading reward! One “top reader” per age group will also receive a $20 Half Price Books gift card. Details are here. HEB Summer Reading Club ~ HEB is a grocery store in Texas, so this promotion applies to Texas residents. Read 10 books, log them on the form, have your parents initial the form, mail in the form, and receive a t-shirt in 3-4 weeks! Details and the form are here. Your form must be post-marked by 10/1/11. 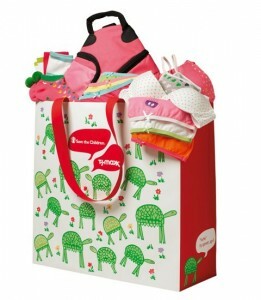 Pottery Barn Kids ~ Visit your local store on Tuesdays from 11-11:30 am for story time! Members receive an official Book Club Passport at their first Story Time and a special gift after attending five story times. You may want to contact your store first to make sure they participate in this promotion. Details are here. Rainforest Cafe Rio Reading Rewards ~ Print the calendar, read 20 minutes per day for one month, and get a kids’ meal for $.99 with the purchae of an adult entree. Details are here. Scholastic Summer Reading Challenge ~ Read books, log your minutes, meet your reading goal, and enter to win prizes! Details are here. You can also submit an essay about your most special family moment, and you will get a free book plus be entered to win a trip for your family to Sea World! Details are here. 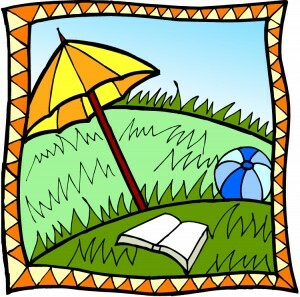 TD Bank ~ If you have a TD Bank in your area, read 10 books this summer, log the books on the form, take the form into your nearest TD Bank branch, and $10 will be deposited into your Young Saver account! Details are here. 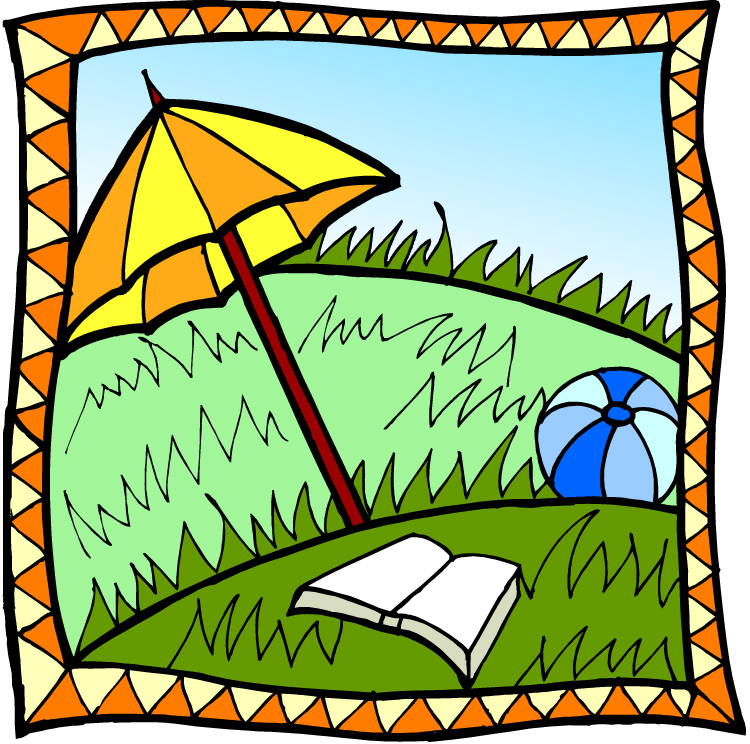 Don’t forget to check out summer reading programs at your local library! Our local libraries offer a summer reading program where kids earn rewards for reading books plus they offer story times for various age groups weekly throughout the summer! If you know of any other summer reading programs, let me know!